I have a special spot in my heart for my backyard birds—the loyal birds that keep me company in the winter, visit my feeders, and sing to me throughout the year. 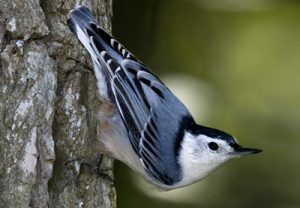 Birds are especially attracted to my garden where they enjoy eating bugs, worms, flower seeds, and berries. My trees and shrubs provide welcoming branches for the birds to build their nests, raise their young, or just stop and rest before flying on. 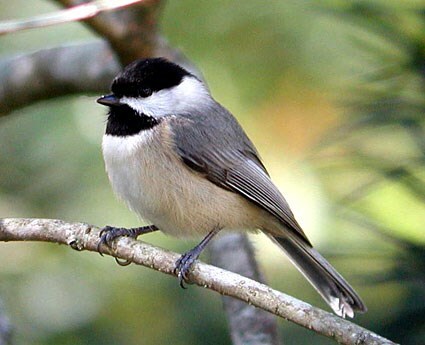 Do you know the most common backyard birds that you’ll see in Western North Carolina? 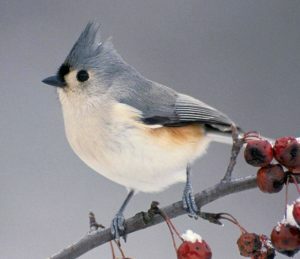 The tufted titmouse is another bird common to our area and is often associated with chickadees. This grey-backed bird has a white stomach with a rusty-red wash under the wings. It has a small crest (hence the “tufted”) and large black eyes which give it an inquisitive expression. The call is a chant: “here, here, here, here” or “peer, peer, peer,” depending on how you hear it. The tufted titmouse is a year-round resident and is happy to come and eat at bird feeders. White-breasted nuthatches are gray birds with black caps that you will see creeping head first down a tree trunk. They are common in yards with large trees. As their name implies, they have white breasts. Their call is a nasal “hank, hank, hank,” somewhat like a toy horn. They, too, are common at feeders, where they will grab a morsel and retreat to a nearby tree to eat. 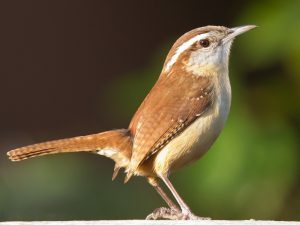 No mention of common backyard birds would be complete without the Carolina wren. These chunky, noisy birds are easily identified by their white eyebrows, warm brown color, and tails that often point upwards. Their common call is usually described as a loud “tea kettle, tea kettle, tea kettle.” They also make a variety of chatters and scolds. Wrens are known for building nests close to human habitation—outdoor light fixtures, hanging baskets of flowers, discarded toys or tires are all fair game. We have had a wren’s nest on top of a ladder in our garage despite the fact we closed the doors at night and often during the day. And, yes, Mama Wren successfully fledged her babies under those conditions. Learning to identify birds is fun and a good family activity. In my next Kids Post, I’ll share tips on providing your backyard birds with food and water.